They have almost arrived at a playoff spot. This is such an amazing feat considering many, including yours truly, thought it to be impossible. I should have known after watching last year’s Sabres not to count them out. Tonight’s 2 points are easily the biggest 2 points of the season for Lindy Ruff and the Buffalo Sabres. A win for Buffalo tonight over the hometown Winnipeg Jets would put them in sole position of the 8th seed in the Eastern Conference. Although they would be tied with Winnipeg for the elusive final playoff spot, they would get the tie break as they have a game in hand. Also in their favor is that the Maple Leafs, Lightning and Capitals are all idle tonight, which means that for one night at least there is no chance for anyone else to catch them. Winning in Winnipeg will be no easy task. With the loudest stadium in Hockey, Evander Kane and the Winnipeg Jets have flourished on home ice going 20-10-4, easily one of the best records in the league. This is compared to a pitiful 11-17-4 on the road. Buffalo meanwhile has not fared much better on the road with a record of 14-16-1 away from the First Niagara Center. Tonight, one of these records will need to take a hit in order for Buffalo to leave Manitoba with 2 points. After knocking off the league’s best team on Saturday night, there aren’t many in Sabreland that doubt their team can come up with the victory. In order to do so, they will need to continue to dominate on defense. Ryan Miller who has only allowed 3 goals in his past 3 games will need to be in the game early in order to keep the Winnipeg Fans at bay. Miller, who blanked two straight opponents, had his shutout streak of 155+ minutes broken at 15:37 of the 2nd period in Vancouver. 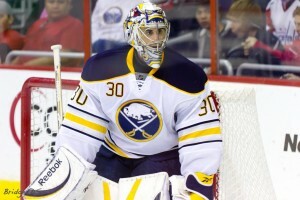 Miller and the Sabres hung on to 5-3 win which helped him to be named the NHL’s 1st star of the week. The secret to winning in the Peg is usually to get the first goal. The question is can the Sabres get there? Will Ville Leino take another shot at winning over some more Buffalo fans who have practically written him off. In Saturday’s game he struck twice in the first 10 minutes of the game. A repeat tonight would at the very least garner the ears of more Queen city fans. He would still have a long way to go. Could Cody Hodgson who spent a few years in Winnipeg with the Manitoba Moose get a good reception. You’ll have to tune in to find out. Tonight’s game gets underway at 8pm EST and is live on NBCSN and TSN Jets for those viewing in Canada. Sundays results were great for both the Jets and Sabres with the Caps, Devils and Sens all losing. With only the one real spot up for grabs, one can be sure that Fan bases across the Eastern Conference will be watching with baited breath praying for the game to be won in regulation. One has to think that if your team is in the playoff picture, you’re cheering for Winnipeg. But if you belong to the Washington Capitals, Toronto Maple Leafs, Tampa Bay Lightning or even the New York Islanders, you’ll be cheering for Buffalo. It should be a good one. Note: Marcus Foligno was an emergency call-up for tonight’s game. One has to think that with Gaustad and Kassian both gone, Foligno was added to the lineup to add some much needed size and toughness. The Sabres will have the night off tomorrow and will be back at home to face off against the Carolina Hurricanes, hoping to make it 5 straight.